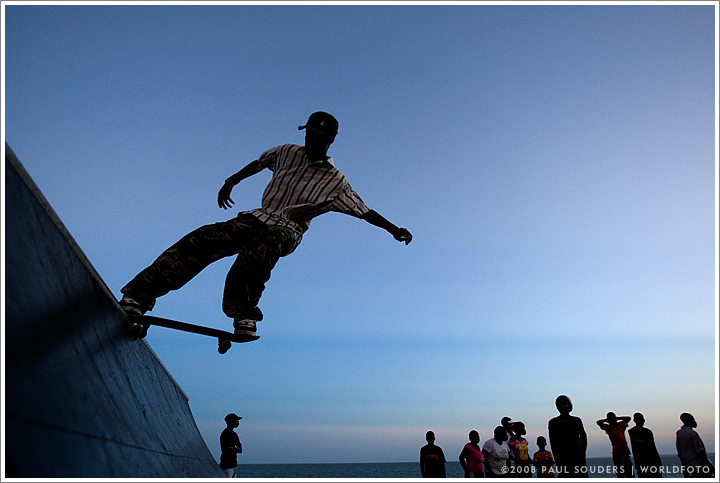 Silhouette of skateboarder riding on makeshift ramp on the Indian Ocean waterfront at dusk in the city of Maputo, Mozambique. Photographed January 13, 2008 with a Canon EOS-1D III camera and 16-35mm f/2.8 lens. Exposure 1/200 seconds at f/2.8 with ISO 800. This entry was posted on Sunday, January 13th, 2008 at 8:33 am. It is filed under On the Road and tagged with Action, Africa, Mozambique, Skateboarding, Travel. You can follow any responses to this entry through the RSS 2.0 feed.